"This is a favourite soup, and now highly in vogue..." [Verral, William. A Complete System of Cookery. 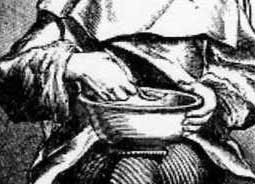 London: 1759] Many of the soups during the 18th century involved putting the cooked vegetables and meat through seive, leaving a clear broth. Vegetables, such as carrots and turnips, were to be cut "riband-like," while celery, leeks and onions were cut in small even slices or "lozenges" shape. [Rundell, Maria. A New System of Domestic Cookery, Phila: 1844] Verral described cutting the carrots and turnips "...about an inch in length, cut long-ways, slice it very thin, and cut into small square pieces the full length..."
Simpson's Cookery in 1834 contained a recipe for Vegetable, or Gardener's Soup which differed from Julienne by cutting "...a variety in the forms of your vegetables - round, crescents, lozenges, and olives, not cut very small." Potage, or Soup a la Julienne. This is a favourite soup, and now highly in vogue, and not much more expensive than the former. [Soup Sante with herbs] Instead of beef and veal for its broth, make it of a hen and veal and a bit of ham, seasoned as before. Make your gravy of it as for Soup sante; provide some bits of carrots about an inch in length, cut long-ways, slice it very thin, and cut it into small square pieces the full length; prepare some turnips in the same manner, some celery in the smallest bits you can of equal length; blanch all this two or three minutes, strain them, and put them in your soup-pot, and when your gravy is ready strain it to them; add to this a little purslane, the hearts of two or three lettuce, a little chervil, spinage, and sorrel, minced fine, and boil it together gently for an hour; get your crusts ready as before, and serve it up. If green pease are to be had fling in an handful or two, but very young, for old ones will thicken your soup, and make it have a bad look, You may serve a chicken up in it, or veal as before. Take a variety of vegetables: such as celery, carrots, turnips, leeks, cauliflower, lettuce, and onions, cut them in shreds of small size, place them in a stew-pan with a little fine salad oil, stew them gently over the fire, adding weak broth from time to time; toast a few slices of bread and cut them into pieces the size and shape of shillings and crowns, soak them in the remainder of the broth, and when the vegetables are well done add all together and let it simmer for a few minutes; a lump of white sugar, with pepper and salt are sufficient seasoning. French Julienne Mill.—To cut into fine parings all kinds of vegetables for soup. [The American Home Cook Book. NY: 1864] second image.